There is always a competition between La Salle and Ateneo in almost all fields - may it be sports, literature, writing, theater and other arts. Putting this subject in a musical theater is a rare opportunity. 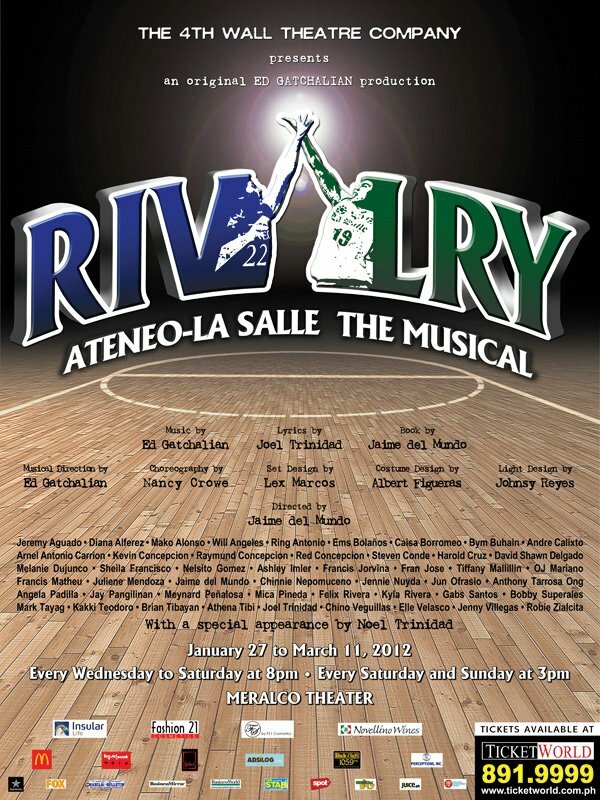 Rivalry: The Musical produced by 4th Wall Productions is showing at the Meralcon Theater in Ortigas, Pasig City that started on January 27 until March 11, 2012. 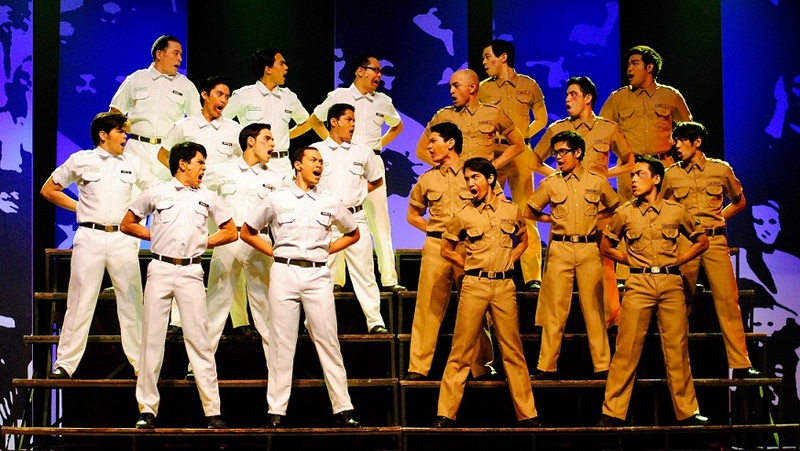 Ed Gatchalian, the show’s executive producer is also its musical director, composer, arranger and orchestrator. Completing the triumvirate were well-known theater actors and directors namely Jaime Del Mundo, who wrote the book, and directed the musical; and Joel Trinidad, who penned the lyrics. 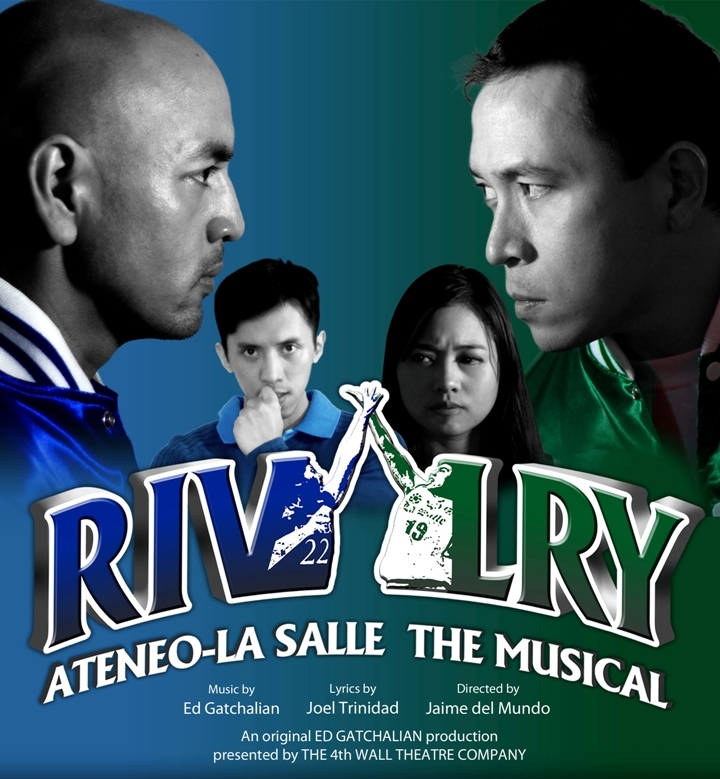 Rivalry: The Musical is a musical feast for every member of the family. 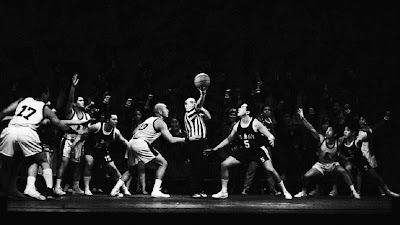 Different issues were tackled like the parent vs. child, the teenage boys vs. teenage girls, varsity games specifically ‘basketball’, love and courtship, academic excellence and sports, and other related conflicts among family members. 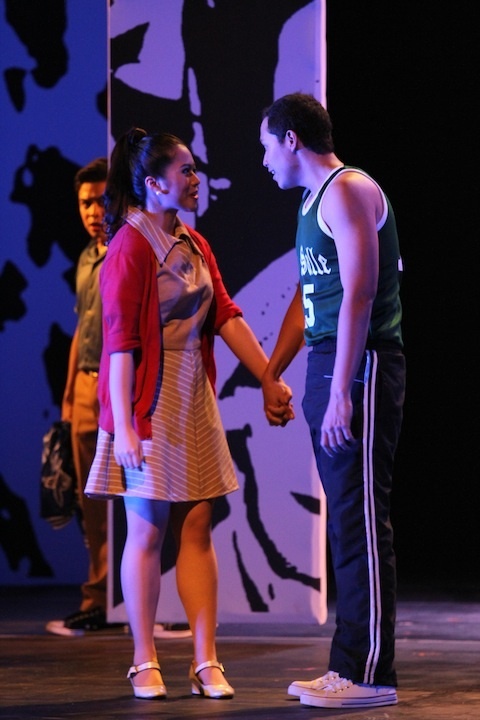 It's an original production about the real lives of students and how they cope up with day-to-day family rules and chores, school norms and academic proficiency. Rivalry: The Musical was written with 1968 as its setting --- an appropriate time when Ateneo and La Salle were still part of the NCAA together with San Sebastian, Letran, San Beda, Mapua and Jose Rizal competing for the annual coveted title as ‘champions’ of the varsity league. 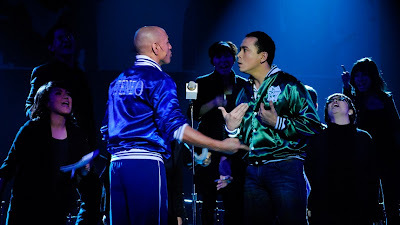 The supporting cast includes Juliene Mendoza as Anton Valencia, Jennifer Nuyda as Andrea Valencia, Raymund Concepcion as Demetrio Basilio, Sheila Francisco as Dolores Basilio and a special appearance of Noel Trinidad as Eliseo Genaro; Meynard Penalosa as the Ateneo coach and Chino Veguillas as the La Salle coach. 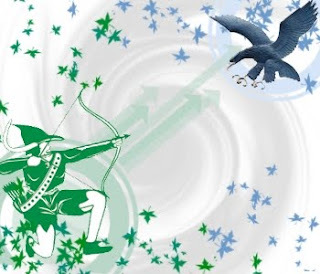 Also featured are Robbie Zialcita, Jun Ofrasio, Arnel Carrion, Steve Conde, Will Angeles and Jaime Del Muindo; Jenny Villegas, Ring Antonio, Ems Bolanos, Melanie Dujunco, Diana Alferez, Elle Velasco, Tifanny Mallilin and Angela Padilla. 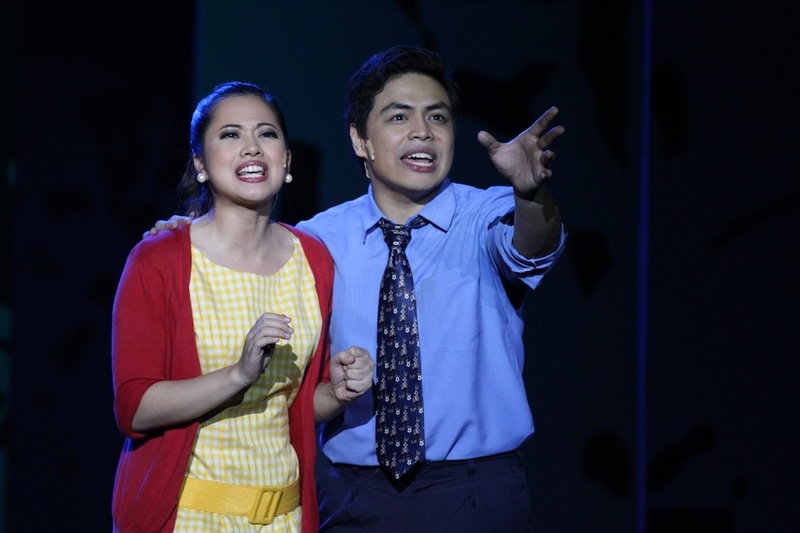 The ensemble is composed of Kaki Teodoro, Caisa Borromeo, Mica Pineda, Chinie Nepomuceno, Kayla Rivera and Bulinggit Delgado as the Maryknollers. Gabs Santos, Nelsito Gomez, Bym Buhain and Mark Tayag as the La Salle varsity. Kevin Concepcion, Andre Calixto, Brian Tibayan, Fran Jose and Francis Matheu as the Ateneo varsity. 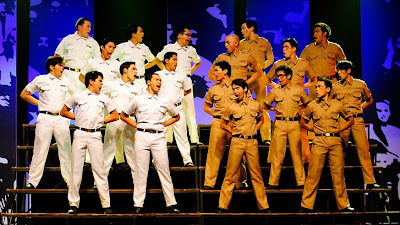 Jay Pangilinan, Bobby Superales, Francis Jovina, Harold Cruz and Anthony Tarossa Ong as young students. 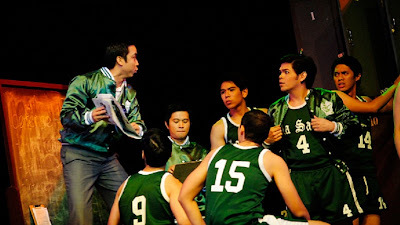 Ed Gatchalian (Musical Director, Composer, Arranger and Orchestrator), Jaime Del Mundo (Book and Director), Joel Trinidad (Lyricist), Johnsy Reyes (Lighting Designer) and Lex Marcos (Set Designer). Leah Reyes (Production Manager and Company Manager), Ed Lacson (Stage Manager), Bobbit Jacinto (Sound Technician), Alfred Ceasar Urieta (Deputy Stage Manager), Roseanne Noelle Cornejo (Assistant Stage Manager); Toots Tolentino (PR & Publicity) and Bing Gorriceta (Marketing). Rivalry: The Musical is brought to you by the following sponsors: Insular Life, Fashion 21 Cosmetics, FS by F21 Cosmetics, Novellino Wines, Mc Donald's, Rockwell Mall, Rockwell Land, Rockwell ClubLiquid Post, Upstart Productions, Adsilog.com, Radio High 105.9, Perceptions, Inc., Fox, StarWorld, Manila Bulletin, Business Mirror, The Philippine Star, Spot, Mellow 94.7, Juice.ph and PEP.